There is a lot of discussion at the moment on the environmental impact of meat production. While intensively reared meat is clearly a concern it’s worth sharing a few facts about our own production at Flexigraze. Here is not the place for a huge discussion of meat eating versus vegetarianism or veganism and the carbon impacts of different systems in general but we believe Flexigraze meat to be at the more sustainable and environmentally friendly end of a very complex spectrum. All our lambs are sourced in the north east or very close by and then they are reared in this region thereafter. They are all killed at an abattoir in the north-east and then butchered locally too. While we do have to transport them locally from site to site their ‘food miles’ are still relatively low. All our animals are grass fed year round with numbers grazing sites balanced with the food available. It is an extremely low intensity system. The areas we graze are generally of high conservation value and we are grazing them to help protect floral diversity or wet grassland habitat for breeding and wintering birds. These are areas that need to be managed in some way and grazing is often the best way to achieve the results that are required. Thus all our grazed land is good for invertebrates either as pollinators in a sward of wild flowers or soil and dung invertebrates that in turn feed the birds on the land. The areas of good conservation land we graze are not suitable for other food production in terms of arable crops. In some cases the land could be, with ‘improvement’, suitable but this would be detrimental to the conservation reasons for management: pollinators and other wildlife. Of course it’s perfectly reasonable to have ethical concerns about meat consumption but we are proud of our high welfare, low intensity grazing system that is also good for wildlife. The meat that we produce is a product of this system as is the wool. It was a wet evening with enough time for a quick check on the ponies at Prestwick Carr, depending on where they were and how visible they were. A quick check from the gate revealed the full complinent nearby and apparently content if a little damp. It’s often tempting to leave it at that, particularly in rain but wit half an hour to kill a wander over seemed like a worthy thing to do. The walk was rewarded with some of the local wildlife. Two wheatears flew low over the field alighting on molehills, their white rump distinguishing them in the dull light. They will be heading into the hills this was just a call on the way. A skylark overhead provided accompaniment, first one then a second joining in. And the ponies were all fine too. Our latest batch of wool has just arrived and we will be getting it ready for sale soon. This year we have skeins of brown Manx loaghtan and a flecked grey which is the result of mixing white Shetland and black Hebridean. We also have carded wool from all three for use in felting or hand spinning. There’s a little bit of work to get it ready for sale but hopefully it will be available very soon. 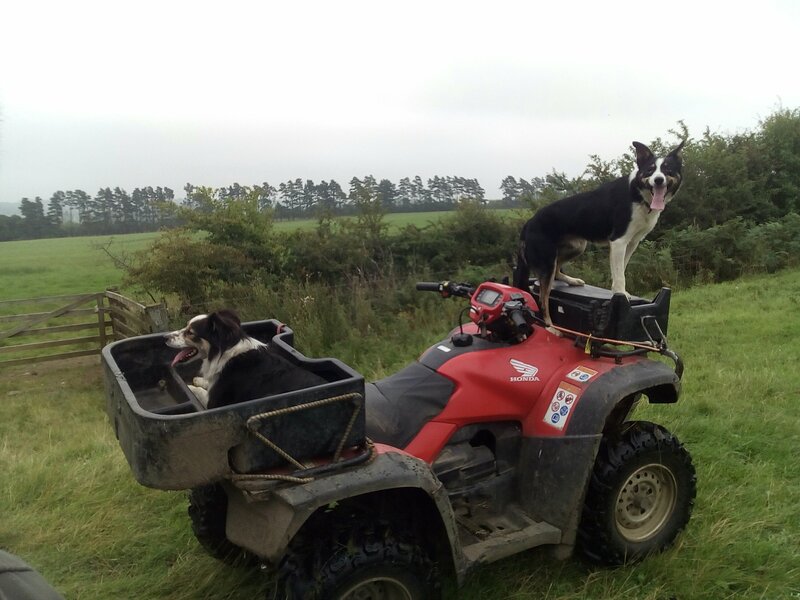 Roger our new sheep dog has settled in well and is working nicely, although he hasn’t quite mastered the ‘on the bike’ command yet! 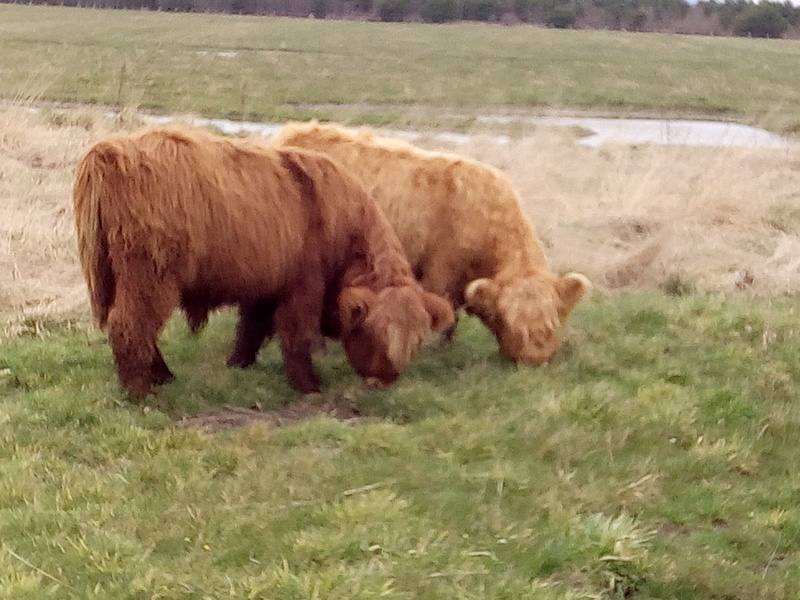 Some of the cattle are now happily grazing away at a new overwintering wader site near Cambois. They will soon be joined by a few more to get the grassland in good condition for the returning birds next autumn.